History of Samaritan Counseling & Growth Center, Inc.
Samaritan Counseling & Growth Center was founded in 1974. It operated under the name of Pastoral Counseling Foundation. Prior to 1974, pastoral counseling in the Bartlesville/Dewey area was provided by individual pastors and priests within the confines of churches primarily for members of their congregations. Early in 1974, a dialogue was initiated among community leadership and a model was presented to the Ministerial Alliance in Bartlesville. Through the efforts of area clergy, attorneys and seven area churches The Pastoral Counseling Foundation was incorporated and the first Board formed. On July 27, 1979, a family estate donated a house to First United Methodist Church. Through the efforts of their pastor the house was given to The Pastoral Counseling Foundation for its office. The Center was located on Oak Street in Bartlesville. In the ensuing years Roger Anderson (1974-1993) and Warren Sapp (1993-2005) served as directors. 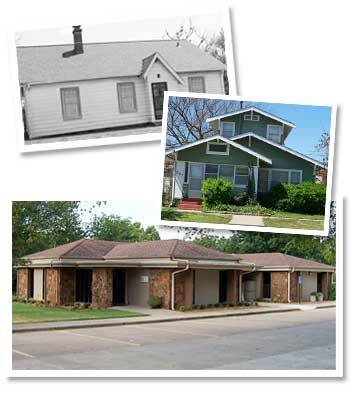 In 1990 a house on Shawnee was purchased and became the home of the Center. In 1990 the Center became affiliated with The Samaritan Institute. It was renamed Samaritan Counseling & Growth Center. It operated at the Shawnee location until 2005. In addition, for a period of time the Center operated satellite offices in Independence and Coffeyville, Kansas. In 2005, the Board of Directors engaged in a capital campaign that resulted in the purchase and remodeling on the current location at 245 SE Madison Blvd., Bartlesville, Oklahoma. The program took occupancy of this new building on December 5, 2005 without debt. Keith Sheffield was appointed Executive Director in June, 2006. At present, the Center is sponsored by 11 Bartlesville churches of various denominations. The Center is reviewed and accredited by the Samaritan Institute on a four year cycle. The American Medical Association, The American Association of Pastoral Counselors, and The President’s Commission on Mental Health have endorsed the Samaritan Institute. The mission of Samaritan Counseling & Growth Center is to provide affordable counseling services that integrate body, mind and spirit to persons seeking opportunities for growth and healing. Our purpose is to function as a natural extension of the Church’s pastoral ministry by promoting spiritual, emotional and relational health for individuals, couples, families and institutions in our area.